1. Le trauma du désamour, du deuil et de l’isolement. Badenoch, B. (2008). Being a brain-wise therapist: A practical guide to interpersonal neurobiology. New York, NY: Norton. Bonanno, G. (2009) The other side of sadness: What the new science of bereavement tells us about life after loss. New York, NY: Basic Books. Bowlby, J. (1973). Separation: Anxiety and anger. Attachment and loss(Vol. 2). New York, NY: Basic Books. Bowlby, J. (1980). Loss: Sadness and depression. London, England: Hogarth Press. Caine, R. N., and Caine, G. (1990). Making Connections: Teaching and the human brain. Nashville, TN: Incentive. Charon, R. (2006). Narrative medicine: Honoring the stories of illness. Oxford, England: Oxford University Press. Charon, R., & Montello, M. (2002). Stories matter: The role of narrative in medical ethics. New York, NY: Routledge. Comte-Sponville, A. (2002). Traité du désespoir et de la béatitude. Paris, France: Presses universitaires de France. Coulehan, J. (2003). Metaphor and medicine: Narrative in clinical practice. The Yale Journal of Biology and Medicine, 76(2), 87–95. Cozolino, L. (2002). The neuroscience of psychotherapy: Building and rebuilding the human brain. New York, NY: Norton. Damasio, A. (2003).Looking for Spinoza: Joy, sorrow, and the human brain. New York, NY: Harcourt. Deacon, T. (1997). The symbolic species: The co-evolution of language and the brain. New York, NY: Norton. Ferro, A. (2006). Psychoanalysis as therapy and storytelling. New York, NY: Routledge. Gerhardt, S. (2004). Why love matters: How affection shapes a baby’s brain. New York, NY: Brunner-Routledge. Gregory, M. W. (2009). Shaped by stories: The ethical power of narratives. Notre Dame, IN: University of Notre Dame Press. Hillman, J. (1964).Suicide and the soul. New York, NY: Harper & Row. Hillman, J. (1975).Re-visioning psychology. New York, NY: Harper & Row. Hillman, J. (1983).Healing fiction. Barrytown, NY: Station Hill Press. Horowitz, M. J., Siegel, B., Holen, A., & Bonanno, G. A. (1997). Diagnostic criteria for complicated grief disorder. American Journal of Psychiatry, 154(7), 904–910. Kalsched, D. (1996). The inner world of trauma: Archetypal defenses of the personal spirit. New York, NY: Routledge. LeDoux, J. (2002). Synaptic self: How our brains become who we are. New York, NY: Penguin. Lynch, J. (1977). The broken heart: The medical consequences of loneliness. New York, NY: Basic Books. McLeod, J. (1997). Narrative and psychotherapy. Thousand Oaks, CA: Sage. Mehl-Madrona, L. (2010). Healing the mind through the power of story: The promise of narrative psychiatry. Rochester, VT: Bear. Meza, J. P., & Passerman, D. S. (2011). Integrating narrative medicine and evidence-based medicine: The everyday social practice of healing. New York, NY: Radcliffe. Paris, G. (2007). 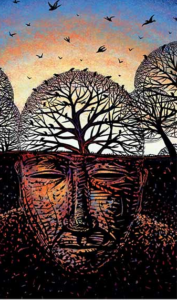 Wisdom of the psyche: Depth psychology after neuroscience. New York, NY: Routledge. Phillips, A. (2005). Going sane: Maps of happiness. New York, NY: HarperCollins. Siegel, D. J. & Solomon, M. F. (Eds.). (2003). Healing Trauma: Attachment, mind, body and brain. New York, NY: Norton. Tallis, R. (2011). Aping mankind: Neuromania, Darwinitis and the misrepresentation of humanity. Durham, England: Acumen. Twenge, J., & Campbell, W. K. (2009). The narcissism epidemic: Living in the age of entitlement. New York, NY: Free Press. Watt, D. F. (2004). Psychotherapy in an age of neuroscience. In J. Corrigall & Wilkinson (Eds. ),Revolutionary connections: Psychotherapy and neuroscience(pp. 79-115). New York, NY: Karnac. Wilkinson, M. (2006). Coming into mind: The main-brain relationship: A Jungian clinical perspective. New York, NY: Routledge. Wilkinson, M. (2010). Changing minds in therapy: Emotion, attachment, trauma, and neurobiology. New York, NY: Norton.